Bromley and Croydon DPAC are holding a benefit Justice meeting Monday 30th May at 7pm at Acts Ministries, Acts House, 30 Union Road, Croydon, CR0 2XU. Its another opportunity for people to come together against the cuts affecting us all. 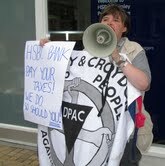 “The Bedroom Tax and the benefits cap, alongside other sweeping changes to the benefits system and the reduction in vital services supporting disabled people and parents, is hitting the poor hard – both those in and out of work,” DPAC’s spokeswoman said. For more information visit www.benefitjustice.wordpress.com. Croydon Council are in the process of agreeing their budget setting which includes a proposed set of cuts to services across Adult Social Care, that amount to £10million being taken out of the budget. The Council carried out a consultation that was inaccessible to disabled people and included no detailed information about the cuts proposed to vital support services that the most disadvantaged members of the community depend upon. We are very concerned that on top of year on year reductions by Croydon, and the huge central government cuts to disability-related benefits and entitlements, these cuts represent a further attack on the quality of life of disabled people. 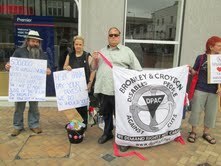 The cuts are adding injury to injury, and mean yet morepainfordisabledpeopleinCroydon.